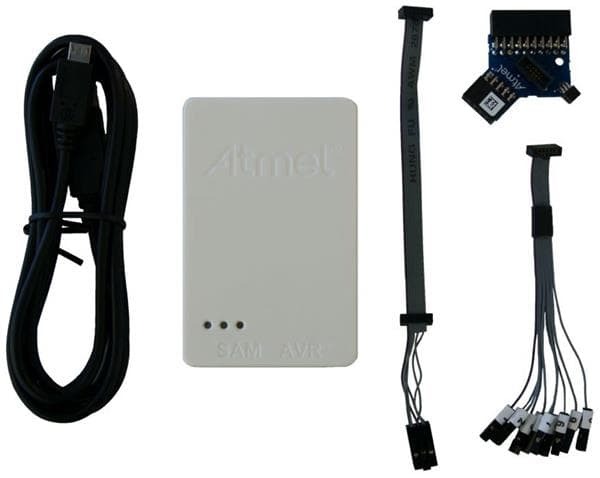 Atmel-ICE is a powerful development tool for debugging and programming ARM® Cortex®-M based Atmel® SAM and Atmel AVR® microcontrollers with On-Chip Debug capability. Consult the supported devices list in the Atmel Studio User Guide for a full list of devices and interfaces supported by this firmware release. Supports 10-pin 50-mil JTAG connector with both AVR and Cortex pinouts. The standard probe cable supports AVR 6-pin ISP/PDI/TPI 100-mil headers as well as 10-pin 50-mil. An adapter is available to support 6-pin 50-mil, 10-pin 100-mil, and 20-pin 100-mil headers. Several kit options are available with different cabling and adapters.